Homemade name. Other possibility: helicone. 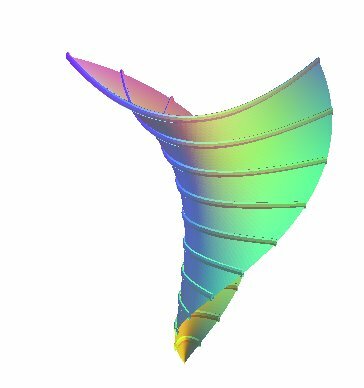 Cartesian parametrization 1: : image of the curve by the similarities with matrices ; the curves for u = constant are spirals traced on the cone . Cartesian parametrization 2: : image of the "horizontal" generatrix obtained for v = 0 by the similarities with matrices (the surface has n "twists" for v between 0 and ). 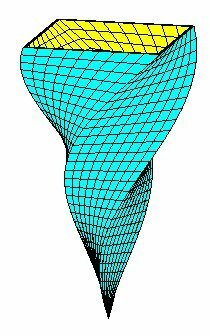 The notion of helico-conical surface refers to any surface globally invariant under the action of the set of similarities of the space, products of a rotation around a fixed axis and a homothety centered (at the "vertex") on the axis, with ratio proportional to the angle of rotation. When the vertex goes to infinity, these surfaces tend to helicoids. 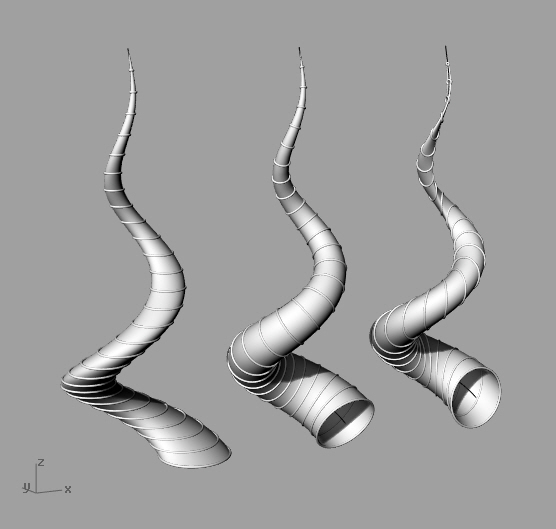 A helico-conical surface is the union of conical spirals. Case of a circular generatrix. These surfaces can be referred to by the portmanteau word "helihorns". 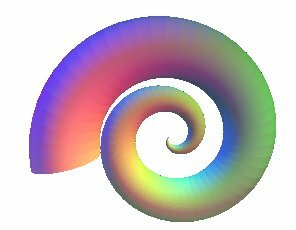 On the left, horizontal generatrix circle, on the middle, generatrix orthogonal to the central spiral, on the right, vertical generatrix. Compare to the circled helicoids. Case where a diameter of the generatrix circle passes by the vertex and is orthogonal to the axis. Case of a linear horizontal generatrix. Assembly of 4 portions of surfaces of this type. Volume= third of the base times the height, like a pyramid. Helico-conical cups, by Robert March. Helico-conical vases, by Alain Esculier.